I should probably preface this by stating that I frickin’ love Turkish kebabs. Seriously. They are delicious. If we had a place in Yeongtong, I would eat there every single day. 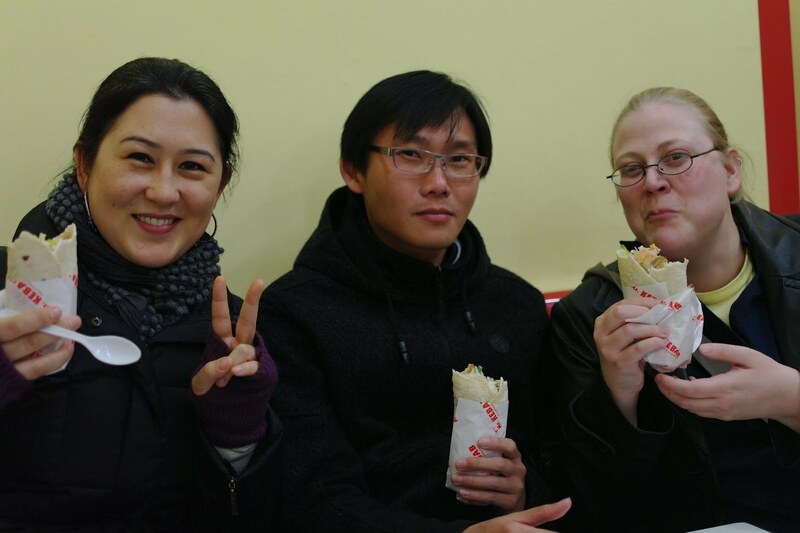 Just walking by one of the kebab places in Itaewon is enough to make your stomach growl. I’m going to mention 2 different places in Itaewon that I’ve been to: Ankara Picnic and Mr. Kebab. There is also a cart that sets up at night that sells kebabs that I’ve heard is good. Hongdae also has some kebab shops, as well. 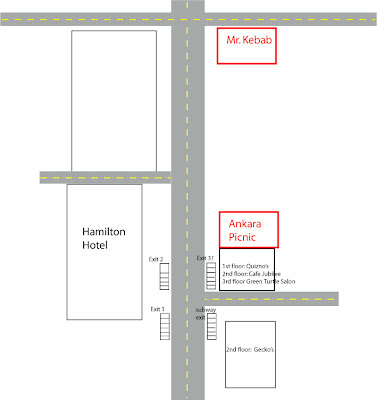 So, Ankara Picnic and Mr. Kebab kind of bookend the block across from Hamilton Hotel. Both are open super late – maybe 24 hours even - so they’re a great snack in between bar hopping. 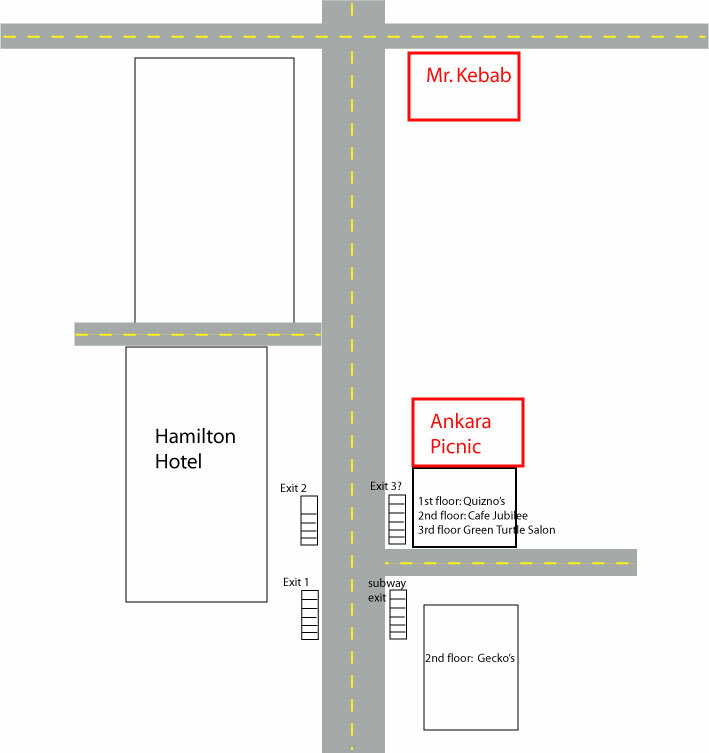 I can’t remember if one is more expensive than the other, but a chicken kebab will run you 4000 won and a lamb kebab will be 5000 won at Ankara Picnic. You can spot the kebab places by the chicken that they slice off the skewers. I’ll work on getting better pictures next time I’m in Itaewon. I love both of these places – which one I happen to go to just depends on where I happen to be in relation to the shops. However, the frequency in which I have kebabs is rare since I've usually just eaten a huge lunch when the smell of the kebab shops hits me and reminds me how much I love these things. They both also offer chicken or lamb kebabs and will offer to make them spicy or just a little spicy (which is still spicy). I always get the chicken kebabs because I love chicken. Ankara Picnic will almost always have a line. The inside of the store is tiny and just has a couple of stools. But it’s all good – kebabs can be eaten outside on the go. They also give you a handy little sleeve to put the kebab in to catch the messiness. At any rate, the kebab consist of either lamb or chicken, tomato, lettuce, and a delicious sauce wrapped in a tortilla (I think it’s a tortilla) of some sort. Sorry for the blurry pic - my camera decided to focus on Justin’s leg instead of the kebab. Mr. Kebab also will usually have a line, but they have a little bit more seating inside. The kebabs consist of the same ingredients and taste just as good. However, last time I was there, Mr. Kebab doesn't put theirs in a plastic sleeve, so you're bound to dribble the kebab sauce on yourself. They also offer yogurt for the kebab, too. This is an old pic of me and some friends having kebabs there late one night. Friends and kebabs – perfect! So yeah, go get a kebab or two. Right now! DO IT!!! And have one for me since I don’t have one near me *sniffle*.